A well-crafted KPI (key performance indicators) dashboard is like oxygen to anyone who depends on efficiently interpreting marketing metrics. It gives a quick insight on the conversion rates in each stage of the marketing funnel and helps ensure that you are acquiring profitable customers under your CAC goal. Many companies still manually assemble metrics from different platforms and add them into complicated excel reports. Having one simple dashboard that is updated in real time and synced with all platforms saves tons of time and effort and is simply indispensable. That’s why you should put forth the effort and build an effective dashboard that will deliver the most worthwhile and introspective graphics. We have done a bit of consolidating ourselves, and have put together a list of the best tools to help you build an awesome KPI dashboard you would be proud to put on your office monitor. Cyfe is an all-in-one dashboard app that helps users monitor and analyze data scattered across all their online services like Google Analytics and Salesforce. You can use Cyfe to offer intelligent, robust dashboards to your employees and clients, and observe the full picture of your business trends and overall health. Project management, and IT dashboard. Special Features: It contains a good amount of data sources, affordable pricing and value for money, top rate customization options for dashboards, CSV and Excel data dashboards, and unlimited users. Grow is a business intelligence software that empowers businesses to become data-driven and accelerate growth by aligning team objectives and inspiring strategic decisions. Grow data dashboards are the simplest way to unite data from hundreds of sources, including spreadsheets, databases, and SaaS applications. With Grow’s dashboard software, enterprise-quality data insights are attainable for any business. Special Features: Grow comes with a vast library of data connections that enables users to create a dashboard in minutes. Only Grow.com provides small businesses a cost-effective system that lets them see all of their key performance indicators (KPIs) in one place by fusing both internal data—from spreadsheets and databases— as well as data from third-party apps like QuickBooks, Salesforce, and Zendesk. With Geckoboard you can aggregate, visualize and share the key data that drives your business. Pull together data from 80+ different services to build your own custom dashboard that communicates the numbers that matter – beautifully, simply and in real time. Price: Pay monthly, starting at $25/month. One month free when paying annually. Special Features: Includes modular key performance indicator (KPI) data dashboard, read-only versions, IP address access option, display multiple dashboards, light, dark, and custom Cascading Style Sheets (CSS) themes. It also integrates with 60-plus data tools and accepts proprietary data sources. 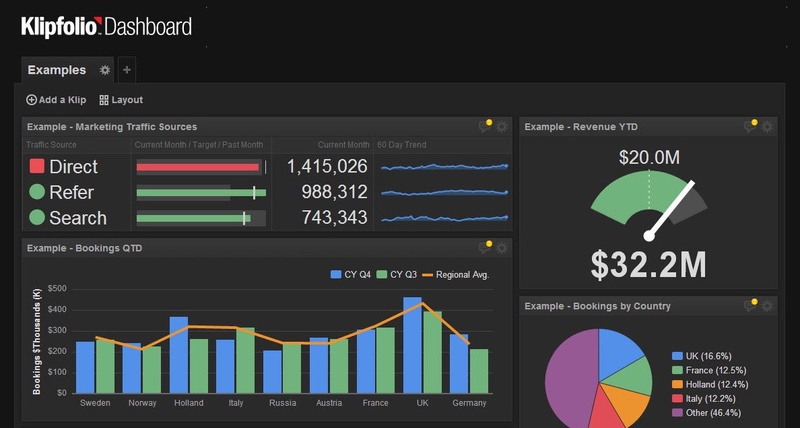 Kipfolio is a cloud app that builds powerful real-time business dashboards. The software is used by a wide variety of businesses, big and small, and by professionals working in a variety of roles, from marketing and sales to BI, consulting and executive management. Special Features: It is 100% cloud-based and allows you to access your data, wherever it is. It also comes with over 300 pre-built metrics and visualizations, has a powerful data visualization editor, can create integrated data mash-ups, and allows for easy sharing. Chartio offers simple and powerful data exploration. It has out-of-the-box connections to your data sources from Amazon Redshift to CSV files, so you can start exploring data immediately. It is built on SQL so there’s no need to learn a proprietary language and deploys a cloud-based application with a few clicks! Special Features: Users can query data from each data source and combine them together into a single analysis or report. It has an intuitive interface that enables users to query data with its Chart Builder.The data pipeline and data stores features allow users to build and store custom metrics. Google Data Studio turns your data into informative dashboards and reports that are easy to read, easy to share, and fully customizable. Dashboarding allows you to tell great data stories to support better business decisions. With Data Studio you can create unlimited custom reports with full editing and sharing. Visually simple and pleasing to the eye. Special Features: Includes live interactive reports and dashboards, has a TV Ad performance dashboard and allows for you to easily connect all your data. Of all the dashboard tools we love, our favorite is the CYFE tool. This tool has found a way to succeed on all fronts and offers everything a marketer would want in a KPI Dashboard. It integrates well with other platforms, is visually pleasing, and is being updated in real time. Not to mention, it has a reasonable price. If there are other tools you think should have made the list, or if you are willing to share your best practices with KPI dashboards, please do it in the comments section below. Looking forward to your input! And don’t forget to check out our top funnel analytics tools list. I�m gone to convey my little brother, that he should also pay a visit this website on regular basis to get updated from most recent information.